Ten German federal states (Bundesländer) participate in the SINUS for Primary Schools programme. Participating teachers at the SINUS schools in these states actively promote the improvement of teaching in accordance with the SINUS concept. Five federal states participate in the programme as »associate members« and can thus follow the progress of the work on the national level. Hence other federal states can observe how e.g. 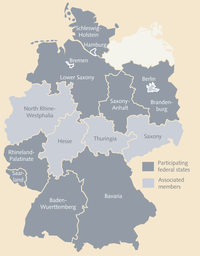 in Berlin or Hesse a state-specific dissemination concept is implemented. The associate members are involved in all channels of information throughout the programme.